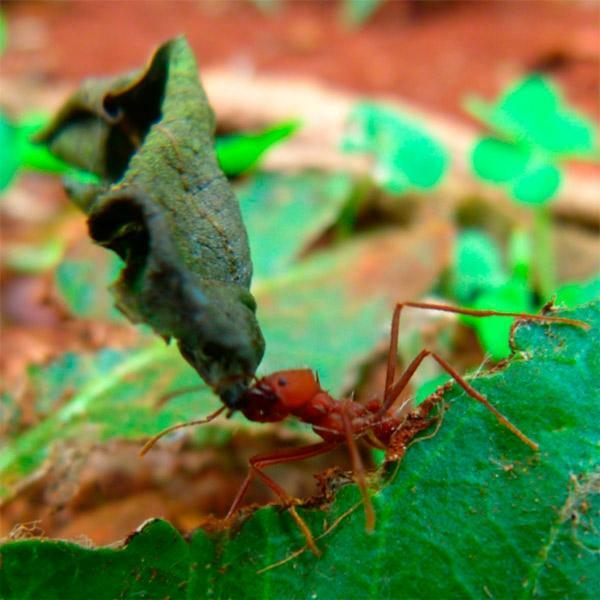 Researchers working on the Ribeirão Preto campus of the University of São Paulo (USP) in Brazil have discovered that a bacterium found in the microbiota associated with leafcutter ant species Atta sexdens rubropilosa produces the so-called "trail pheromones", i.e, the aromatic chemical compounds used by the ants to lay a trail to their nest. An article on their findings has been published in the journal Scientific Reports. In the case of Atta sexdens rubropilosa, substances belonging to the class of heterocyclic compounds known as pyrazines guide the ants without deviation on their way to the anthill. Researcher Mônica Tallarico Pupo, a professor in the University of São Paulo's Ribeirão Preto School of Pharmaceutical Sciences (FCFRP-USP) and the principal investigator for the project, stressed that pyrazine production by the ants' microbiome was observed in more than one colony. "Are the trail pheromones produced by bacterium Serratia marcescens or does S. marcescens only help by somehow adding to the whole process? We intend to investigate in search of answers," she said. The study was part of Eduardo Afonso da Silva Junior's PhD research and was conducted in partnership with scientists at Harvard University in the United States under the aegis of a Thematic Project supported by the São Paulo Research Foundation – FAPESP and the US National Institutes of Health (NIH). "The leaves carried to their nests by these leafcutters actually serve as a substrate for the cultivation of Leucoagaricus gongylophorous, the fungal species on which they feed. However, this system is susceptible to infections," Pupo explained. "In some cases, another pathogenic species that may impair the ant colony's viability grows on the fungus they eat. The symbiotic bacteria produce compounds that can kill the parasitic fungi without damaging the food source. We set out to identify these compounds." Added the FAPESP grant coordinator. The experiments described in the article involved colonies collected on USP's Ribeirão Preto campus. When the scientists succeeded in collecting the queen, part of the colony was transported to the laboratory, and all the bacteria found on the insects' surface and inside their bodies were isolated, characterized, and placed in culture medium. "We decided to investigate the volatile compounds produced by this bacterium and discovered the pyrazines, among which there was a molecule not described in the scientific literature," Pupo said. "We found both pyrazines and bacteria in the ants' poison glands," Pupo said. "We don't know for sure if their synthesis is shared: maybe the microorganism produces the aromatic compounds and the ants store them in their glands. In future studies, we plan to test techniques to remove the bacteria from the ants and observe whether the compounds continue to be produced." The cultivation of fungi in the nest for food or defense seems to be a widespread practice among social insects. According to an article by Brazilian researchers published in 2015 in the journal Current Biology, the newborn larvae of Scaptotrigona depilis, a species of stingless bee native to Brazil, feed on filaments of a fungus cultivated in the brood cells. Without this food, few larvae survive to become adults. This symbiosis was recently studied in greater depth by Pupo's group during Camila Paludo's PhD research as part of the same FAPESP-funded Thematic Project. The results were published in Scientific Reports in January 2018. "We know insects can't synthesize hormones, so they must obtain precursor substances from their food," Pupo said. "Our hypothesis was that the fungus supplied a precursor for the molting and pupating hormone required for larvae to complete the metamorphosis into adult bees." "We aren't sure how this fungus gets into brood cells. The bees lay eggs and then fill the cells with a liquid called larval food. Some three days later, the fungus begins to grow inside the cells," Pupo said. "Steroids, the precursors of molting hormones, are lipids. Using GC-MS, we found that the predominant compound among the lipids in this fungus was ergosterol," Pupo said. "The results were statistically equivalent for these two situations," Pupo explained. "When the larvae received only larval food without the fungus, they failed to reach the adult stage. We, therefore, concluded that ergosterol was in fact being used by the larvae to produce molting hormone, which reinforces the dependency between these bees and the fungus."